Posted on April 6, 2010	by Lou Murray, Ph.D.
Wow, what an exciting Easter we had, with a 7.2 magnitude earthquake. Vic and I were visiting our son Scott in San Diego, so we were closer to the epicenter than we would have been at home. The shaking went on a long time, seemed like a full minute. Very noisy. It sounds like a freight train going by with rattling and banging. And of course you shake. Walls and windows bulge in and out and everything indoors and out rattles. Kinda exciting if there’s no damage. Earthquake map for southern California minutes after the 7.2 Mexicali temblor. Scott immediately logged onto his laptop to see where the epicenter was. It felt pretty close because of the duration and intensity. We were 140 miles away, with the epicenter in Mexicali. The automatically generated initial reports pegged the temblor at 6.9, but analysis by a researcher upgraded it to 7.2. 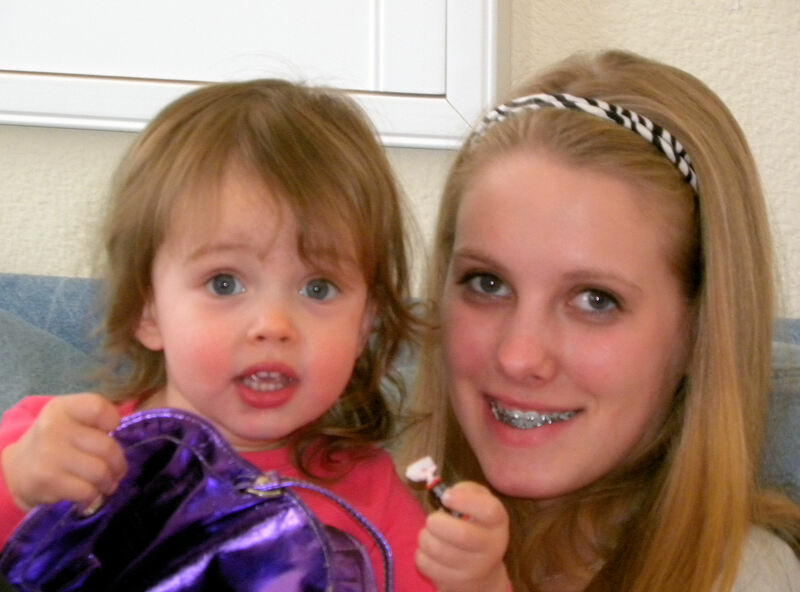 Our 16-year-old granddaughter Shannon was visiting from Seattle. We told her that we like to have earthquakes for visitors. That was a pretty exciting one, the biggest one I’ve felt in a long time. Pictures were knocked askew on the walls, but there was no damage. There have been LOADS of aftershocks as the earth readjusts to the new positions of the plates. The twins were upstairs taking their naps, but Allison woke up. She told her mother that her lamp was shaking. It was the twins’ first big quake, but Lauren slept through it. Southern California earthquake map about 17 hours after the initial big quake. There are hundreds of aftershocks. 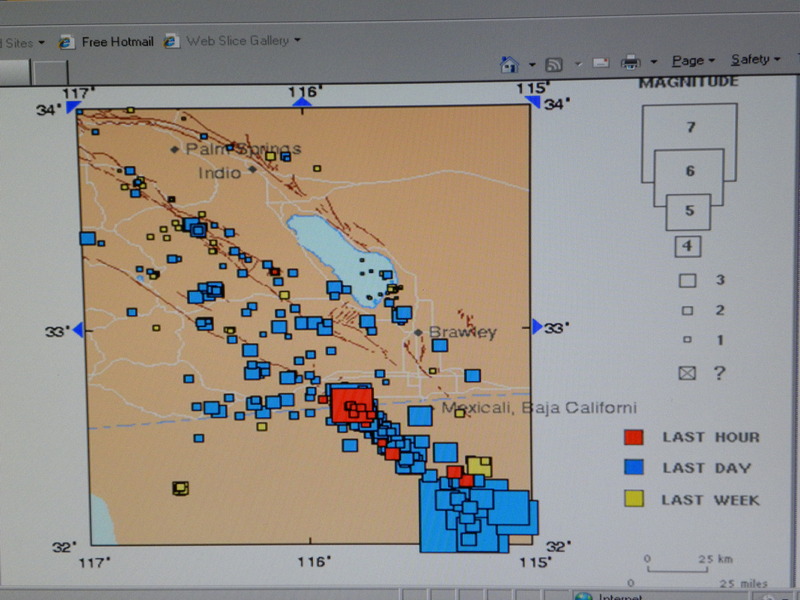 Size of squares indicates intensity of quake while color indicates how recent the quake was. Red means within the past hour, while blue indicates within the last 24 hours. Yellow indicates within the past week. As you can see, the San Andreas is very active today. 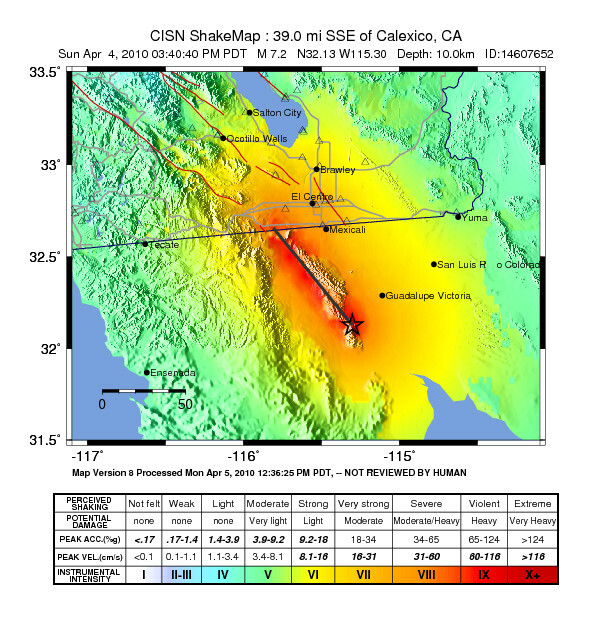 This map from USGS shows the intensity of the initial quake over a broad area. We were in the light green zone, and felt moderate shaking with no damage. This entry was posted in Uncategorized and tagged 7.2, Baja California, earthquake, Easter Sunday, maps, Mexicali, southern California. Bookmark the permalink. Hope this will remind people that we do indeed live in the area of sizeable quakes, and they need to be prepared. We were in Santa Ana, sitting in our car, and felt it for about 15 seconds. Our kids in Anaheim Hills said the rolling motion made them feel nauseous. I’m glad y’all weren’t hurt. The part of living in California that none of us likes to think about…but it’s part and parcel of choosing to live here. Glad to hear it was mostly just a little excitement on Easter for you, and that there’s no appreciable damage. Wow! How scary. We don’t have many earthquakes here in Maine. I remember one 4.0 that felt like a truck hit the building. I can’t imagine what a 7.2 would be like. It must have seemed like a long 15 seconds. Glad everyone is ok.
Hi GrafixMuse, Curbstone, Daphne, and Kathy. I’ve been monitoring the earthquake map site off and on all day and am stunned at the number of aftershocks. We’re not feeling any of them here in Huntington Beach, but if you go back a few posts to my one on Birding the Salton Sea, we were at the Rio Bend RV Park, which is right on top of the quakes that are shaking Seeley every few minutes. Betcha they’re feeling them.